The thought of me finally ending my student days, being employed and landing myself a job hasn’t quite fully sunk in just yet (Ignore the corresponding date to this entry, at the time I am writing this it’s already the 8th of June). Which is weird, because by now I thought I would’ve settled into working life quite nicely-- almost as though it was second nature to me. But the transition is taking a lot longer than I had initially expected. The environment at work is very quiet, and tense, and serious. Sometimes I find myself fighting the urge to get up and dance just to relieve the tension. But that said, I realize, less time bonding with co-workers, the more time I have to myself to focus on work. Or rather to immerse myself in the copious amount of music I have to listen to these days. What's more is that I’ve found it’s a good way to pass by the time while I wait for the clock to strike 5pm. I almost always seem to reach out for that same loud, energetic, pop songs as the music selection for while I’m at work. 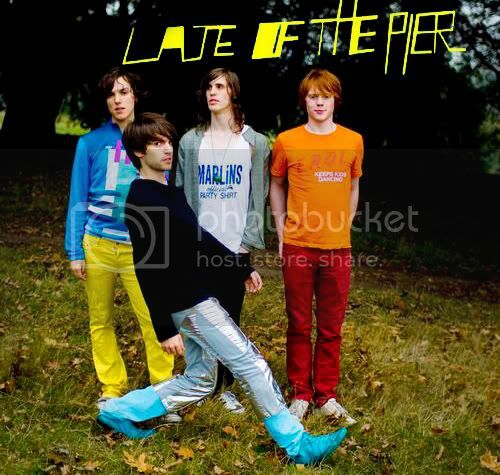 And the British electro-pop quartet, Late of the Pier, falls right smack in the middle of that category. The band is definitely not new and most of you, I’m sure, are more than familiar with their line of work. I on the other hand, have my friend to thank for pointing me towards the group’s direction and for that I am eternally grateful. So now we’re even okay?